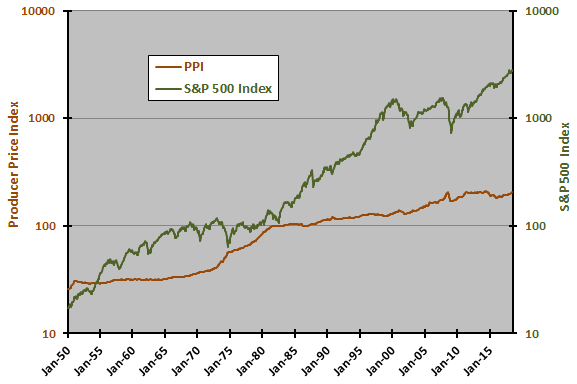 The following chart tracks PPI and the S&P 500 Index, both with monthly data on logarithmic scales, over the full sample period. Note that BLS releases new PPI readings about the middle of the next month.Visual inspection indicates that the stock market rises faster than PPI, with more volatility. 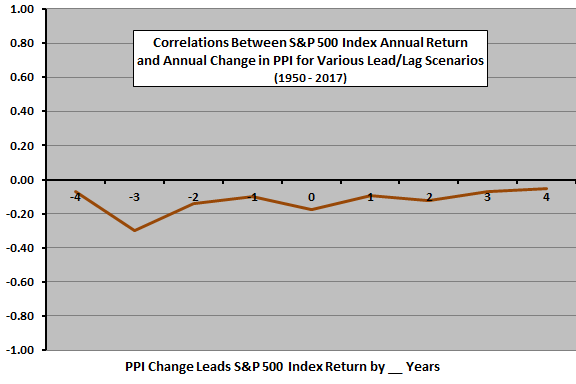 While the rapid increase in PPI during the 1970s does appear to be bad for stocks, there is no obvious systematic long-term relationship between the two series. For a closer look, we compare monthly changes in PPI to monthly S&P 500 Index returns. 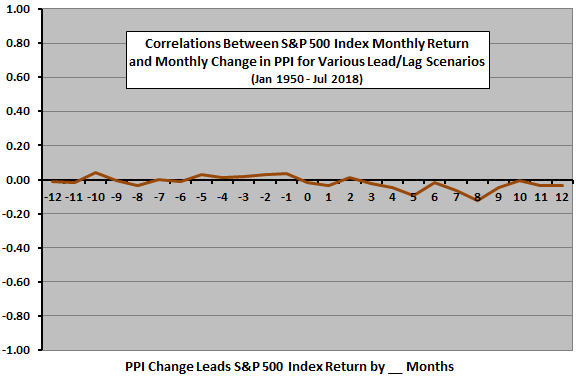 The next chart summarizes correlations between monthly S&P 500 Index return and monthly change in PPI for various lead-lag relationships, ranging from stock market return leads PPI change by 12 months (-12) to PPI change leads stock market return by 12 months (12). All correlations are small. There is some indication of a cumulative negative relationship between change in PPI and stock market return over many future months. However, the relationship is noisy. In case this cumulative relationship is useful, we look at annual measurement intervals. Strong (weak) stock market returns in previous years imposes downward (upward) pressure on the PPI trend. There is a modest contemporaneous negative relationship between PPI changes and stock market returns. Annual changes in PPI related negatively, but weakly to stock market returns in future years. The sample is small for this kind of analysis. In case there is an important non-linearity in the relationship, we look at future S&P 500 Index return by ranked third (tercile) of annual changes in PPI. 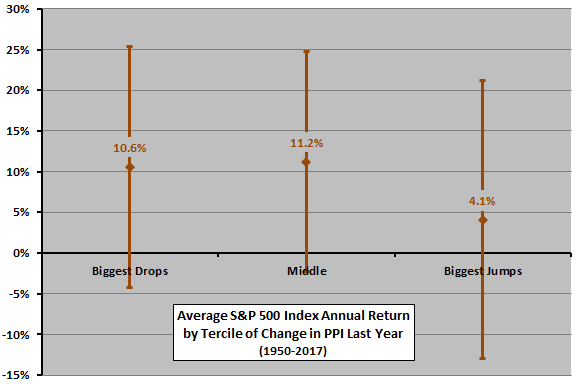 The final chart summarizes average annual next-year S&P 500 Index returns by tercile of annual change in PPI, with one standard deviation variability ranges. For this analysis, we measure PPI at the end of December and the S&P 500 Index at the ends of the following January to ensure an investor could know annual change in PPI in advance. Results indicate that the stock market return tends to be weak (but not negative) in years following relatively large increases in PPI. However, again, the sample is small for this kind of analysis. There are only 22 observations per tercile. In summary, evidence indicates that PPI may be a useful indicator for future U.S. stock market behavior at horizons of a year, with large increases in PPI bad for stocks. As noted, BLS releases PPI data with a half-month delay. There may be short-term revisions and long-term adjustments to the historical record, making data somewhat different from as-released data. The above analyses are in-sample, using the entire set of data retrospectively. An investor operating in real time would have only inception-to-date data and findings may vary over time. The annual sample is not long enough for out-of-sample testing. The above analyses do not rule out the possibility that surprises in PPI, relative to some measurable expectation, usefully forecast stock market returns at a short horizon.